Move quick. Be efficient. Don’t stop. Keep killing. Collect everything. The Wandering Vagrant is here. Oh, I’m dead. I need a game like Risk of Rain to come along once in a while. I spend a lot of time contemplating storytelling, pondering over things like narrative and character motivation in games as often as I do mechanics. Then Risk of Rain comes along to remind me a game doesn’t always need narrative tools to invoke feelings of pressure and desperation. All it needs is limited resources, a ticking timer, and a swarm of enemies. It won’t be long until the player feels a very real sense of panic on their own. 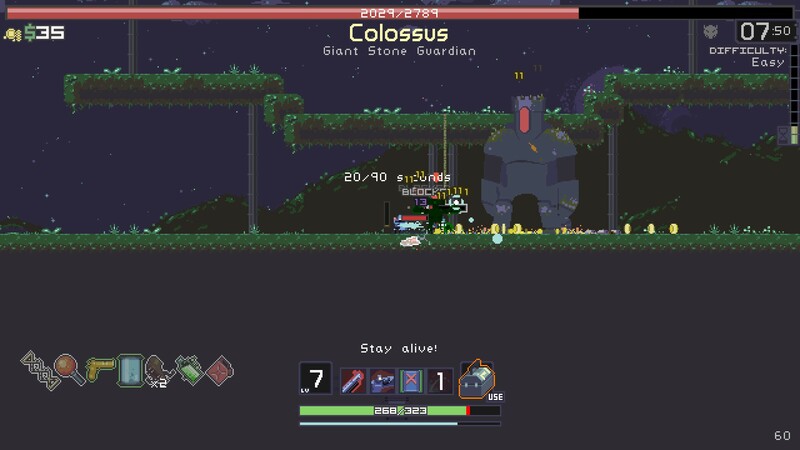 Risk of Rain is a sci-fi themed action roguelike from Hopoo games. A space transport carrying cargo crash lands on a remote planet and it’s up to the survivor (or survivors, if you happen to be playing in co-op) to find a way home. The cargo from your wrecked transport acts as the collectable items and weapons spread across each planet. 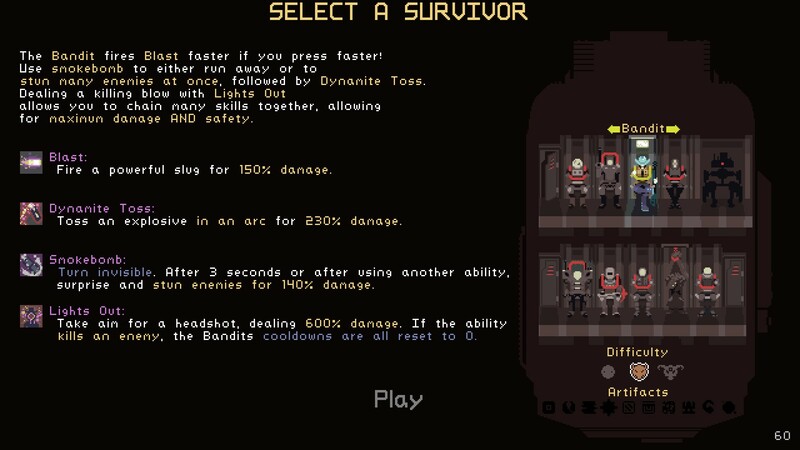 On a good run you’ll amass an impressive handful of rocket launchers, knives and fungal spores. On a bad one, well… at least starting over is really quick. More on that later. On a successful run, the bottom of the screen is filled up with items. 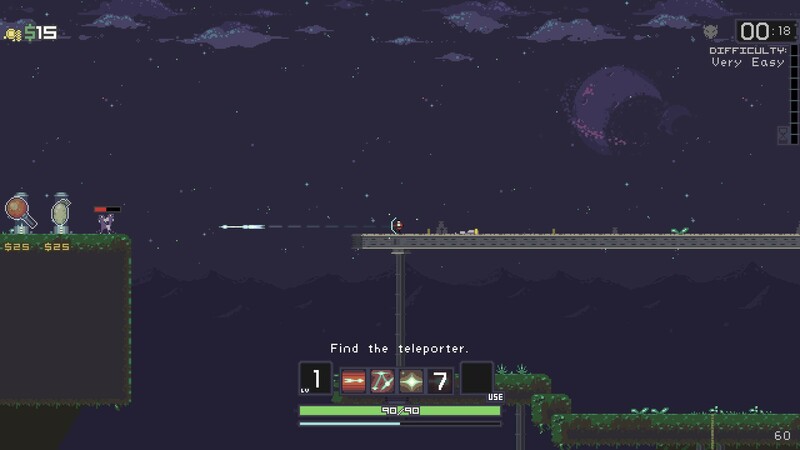 After selecting a character you’re immediately thrown into the game and presented with a very simple goal; “Get to the teleporter.” A timer sits in the top right of the screen with a bar next to it. As the timer ticks, the bar fills, each notch in the bar raising the difficulty level one more step. Now it’s off to find the teleporter, but the game gives no indication of where it might be in the world. it’s up to you to do some creature killing and world exploring to find its location. The Enforcer’s stun grenade and shield allows him to holdout against an unreal amount of enemies. When you do find the teleporter, an onslaught begins. A random boss appears and your mission changes to another simple command; “Survive!” For the next 90 seconds enemies constantly spawn near your location. (At higher difficulties, you’ll even start encountering multiple bosses during these horde events.) If you survive, the enemies on this particular planet are gone for good. 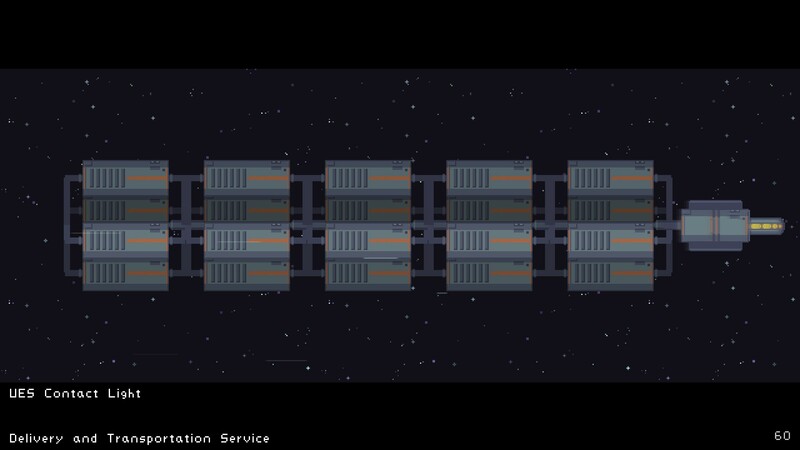 A prompt will appear over the teleporter and you can safely advance to the next stage. And sure, you can press that prompt. Or you could go wander, searching for items and chests without fear of death... and you will want all the cargo you can find. Risk of Rain offers items that do far more than provide stat increases. Instead you’ll have a chance to fire missiles with every auto attack, or fill the screen with the ghosts of fallen enemies. It’s possible to find a jetpack and soar over tricky platforming sections. In Risk of Rain, even a disembodied bouncing brain or an electrified ukulele is a viable weapon. The Huntress is at her best when constantly moving. In other words, not what I’m doing here. But choosing to explore instead of advance presents a deadly risk. Killing enemies provides money to open chests and collect items, while also netting experience to level up. 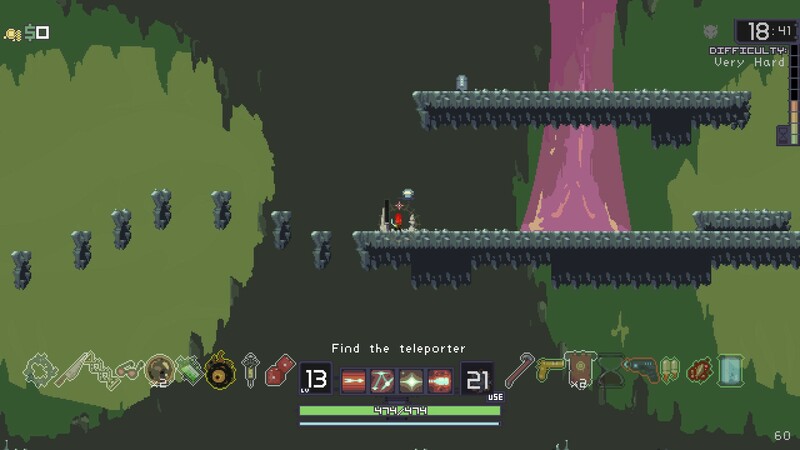 The difficulty bar never stops filling, so the longer spent amassing items after a teleporter event, the stronger the enemies on the other side of the teleporter get... and the longer you’ve gone without leveling. Greed ended more of my runs then I’d like to admit. One teleport later and I find myself being torn apart by teleporting imps, all the items I amassed on the previous empty landscape worthless. And just like that the run is over. No levels or items carry on to the next round. New characters and collectable items will unlock on successful runs, however, meaning there will be new discoveries and mechanics to see on subsequent playthroughs. There’s also a chance to see one of two different worlds on each teleporter jump, providing new sights to see and new creatures to kill. Its a genius hook that makes death sting a little less, and encourages you to immediately hop back in and check out all the new things earned. 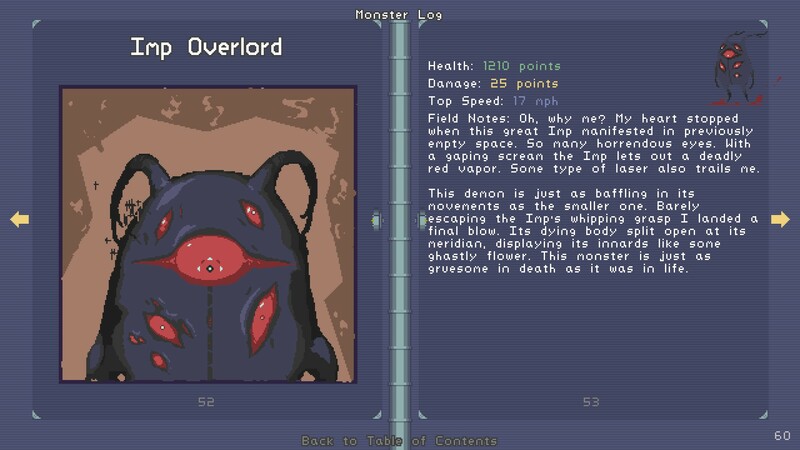 Unlockable journal pages provide all the ghastly details on the creatures trying to eat you. There’s only one character available at the start, but nine others can be unlocked later. Some will require just making progress, while others need to be found within particular stages. (Regarding the characters hidden in worlds; the best advice I can offer is to check the four corners of each map. They don’t always spawn, but every hidden character is located at one of the extremes when they do.) Each character’s approach to combat is dictated by four different moves, which often alters their ideal playstyle. The huntress, for example, is the only character that can shoot and move at the same time. The engineer can instead control a single area with the use of turrets, mines, mortar fire and bouncing bombs. Every character on this screen is unique… and I still haven’t unlocked the damn robot on the top right. The only issue I have with Risk of Rain is the co-op. In local co-op, the players share a single screen, and the game does its best to zoom out to include both characters when they start to spread apart. This system has a limit though, and it can be near impossible to figure out how to reunite if the players are driven too far apart. It’d be nice to just avoid being separated, but unavoidable situations arise that will cause the screen to give up. On the Damp Cavern level, for example, there are holes that will drop a player down a floor. If one player avoids the hole and the other doesn’t, the screen goes nuts trying to keep both people on the map. It would’ve been nice to see dynamic split screen, or if that’s a bit difficult to implement, just an option to default to a permanent split screen. The other option to solve the issue is to play together via online play, but like Jurassic Park: The Lost World, this merely solves one problem and creates several new ones. Risk of Rain requires inputting a manual IP and port for online play. If phrases like port forwarding and IP filtering make sense to you, I imagine this will be a small barrier to entry. As someone who assumes the internet works through some kind of complicated incantation, however, it serves to be very confusing when trying to set up a game. In order to get it working a friend employed the use of a third party networking assistant, and even then it unexpectedly stopped functioning. 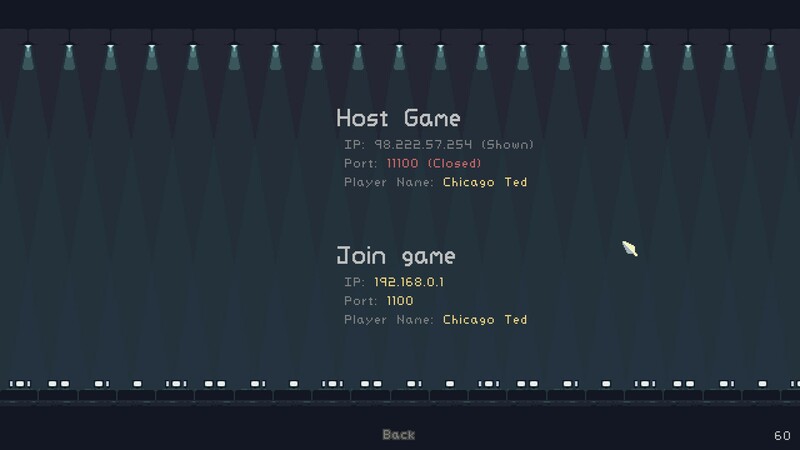 Despite my best efforts tinkering with my own router settings, I can only currently get an online game working online via the local network. The good new is when it does work, it’s worth the hassle. The times I’ve successfully joined a game of multiplayer were the best I’ve had with Risk of Rain. I’d love to be able to click a button and join a group of strangers in a fight for survival; for now, I’ll just add it to my future update wishlist. I’ve spent an awful lot of time staring, changing, and yelling at this menu. Despite any gripes about co-op I might have, I reccomend Risk of Rain to, um... everyone. There’s bound to be some outliers, I’m sure. No game exists that appeases everyone. Right now though, I feel far too passionate about Risk of Rain to set my bias aside and come up with my usual cautionary sentence. If you are breathing, I suggest Risk of Rain. I suggest it to your dog, your cat, your chinchillas. The fish in the fish tank should play Risk of Rain. Risk of Rain is available for $10 on steam. There’s an update in the works, so keep an eye out for a sale. If $10 sounds like too steep an investment to go in blind (and you fear you might be one of the outliers), there’s a playable demo available on the Hopoo games website. As I bring this to a close, I realize I’ve neglected to mention Chris Christodoulou’s incredible soundtrack. Every song has a creeping, ominous vibe. It strikes the loneliness and desperation home, but still manages to maintain an upbeat tempo to fit the games focus on action. You can listen to it for free (or buy it) here. For those of you pondering over the song titled 25.3N 91.7E, those are the latitude/longitude coordinates for Cherrapunji, India. The city holds the record for the highest amount of annual rainfall. I love these clever bastards, and I can’t wait to see what they have in store for the next update. Here comes the UES Monsoon. Next stop: Your face!